My husband l.o.v.e.s Apple products. Steve Jobs gives twice a year on the latest and greatest Mac products and upgrades. He's pretty much been trying to turn me onto all things Apple since we met. Every Apple product I own was given to me by Aaron. First it was an I pod when we were dating. Then a year or so ago he bought me an I phone. Oh how I love my I phone. Then he bought me my Macbook and officially converted me to all things Apple. It might have been the happiest day of his life. 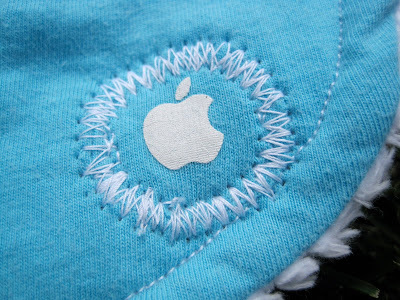 Aaron worked at Mac a while ago and we have a ton of his old Apple T-shirts. 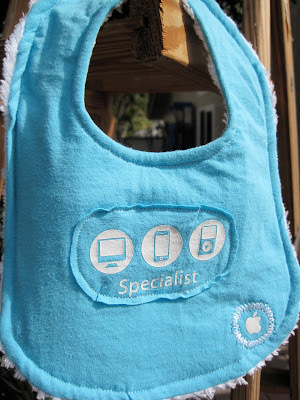 The other day I cut one up and used it to make Wesley a bib. Wesley will grow up to be a Mac lover too. i found your blog cause i'm friends with your husband on fb. i think we all went to biola together. anyway... my husband works at apple too and he has TONS of shirts that we can't give to goodwill - but this is a FABULOUS idea!!! now i just gotta work on the baby part... ha! nicely done!